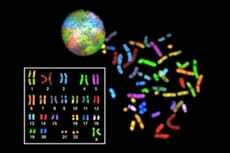 Trisomic disorders like Down’s syndrome (DS) may be corrected per a study published in Cell Stem Cell. Li B. Li and fellow researchers generated induced pluripotent stem (iPS) cells from DS patient skin samples. They then targeted the extra chromosome and removed it from the affected cells. Compared to the trisomic DS cells, the disomic cells were not significantly different in their ability to differentiate into hematopoietic cells. Consequently, these cells may serve as a model for comparison to further understanding of DS.